Just when Paul Dini on Zatanna was about considered hocus pocus, The Source blog has announced the long talked about series will finally hit stands in May. Joined by artist Stephane Roux, Dini is looking forward to crafting an all new rouges gallery for everybodys favourite gal in fishnets and a top-hat. As if this little 3 panel 'slugfest' doesn't sell the book on its own, Paul tells The Source, "As Zatanna herself says in the first issue, there’s little in the way of human punishment that can be enforced on evil mystics. There are few laws they are compelled to obey, no jails to hold them, and no way ordinary people can defend themselves from their attacks. Zatanna has taken it upon herself to operate as both peacekeeper and avenger between those two worlds." 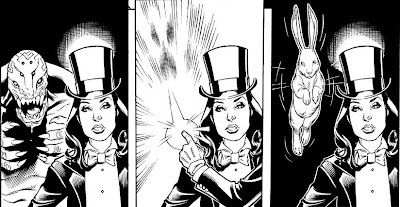 For more Zatanna preview pages from the May launch hit the Jump.